Occasional individuals have been seen on the north-western coast for a month and the groups are larger where the salinity of the water is higher. 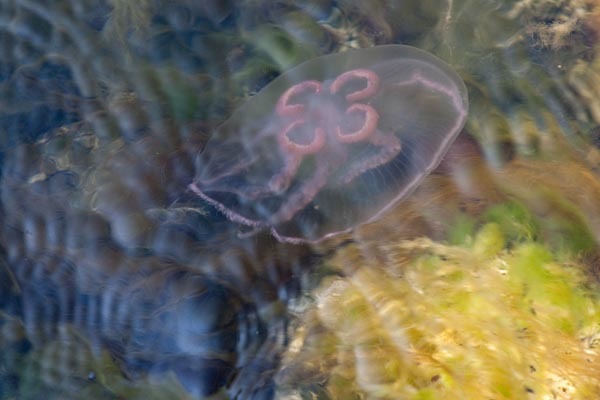 Moon jellyfish are brought into our shore waters in greater numbers in August, with stronger westerly winds and currents but they can also move slightly on their own. From May onwards they have passed many development stages to become like the moon jellyfish that we are accustomed to see. What do they feed on – drifting microscopic animals, or plankton, in the sea water. There are lobes around the mouth with stinging glands on them; they secrete a substance that is lethal for plankton. Food is brought towards the mouth with the lobes, or oral arms. For humans the substance is usually harmless but there are exceptions although the reaction is weak. The jellyfish have separate sexes, female and male. In late autumn they perish, having fulfilled their reproductive function already before reaching our waters.